048. 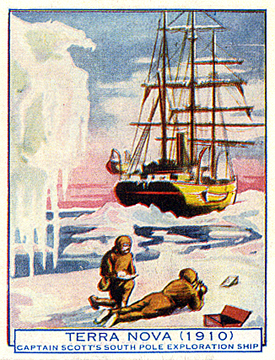 TERRA NOVA (1910) CAPTAIN SCOTT'S SOUTH POLE EXPLORATION SHIP. Issued by D.C. Thomson & Co. Ltd. (Date: ?). Card unnumbered; from a set of 32 entitled "Famous Ships". Size: Ca. 2.5" x 3.1". Verso: FAMOUS SHIPS | THE TERRA NOVA | Only the best is good enough to brave the dangers of the frozen seas, and the Terra Nova was one of the very best.